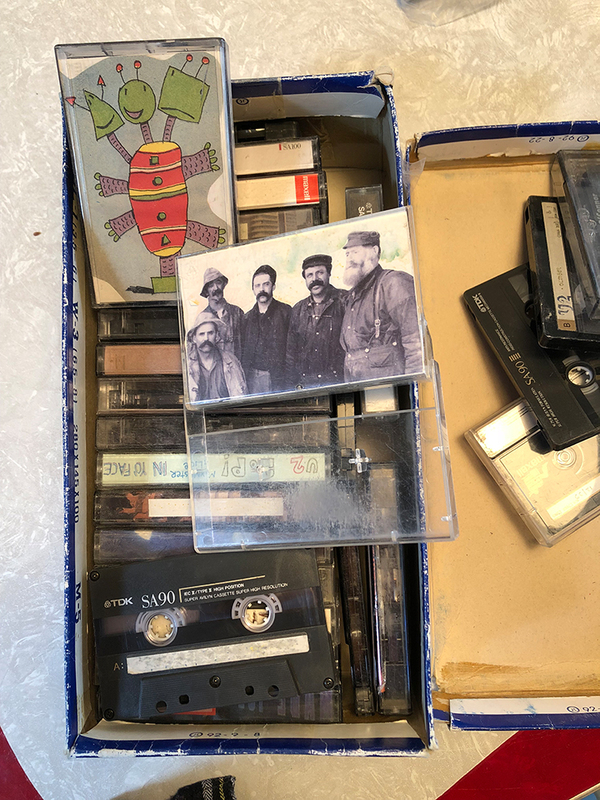 This is a box full of mixed tapes that my friends and my older brothers made for me when I was younger (Photo by Kristin Becker, 2018). I still have an old shoebox full of the mixed tapes that I listened to in my car during high school and college. Any one of these tapes with hand-made, illustrated case covers would be an appropriate technological artifact to define both me personally, and my generation as a whole. High school and college is an important coming-of-age period in most people’s lives, and music is often an important part of that time, influencing musical and cultural preferences into adulthood. Most of us have more free time at this point in our lives–at least I did–before the demands of full adulthood take complete hold of our lives. Since entering my thirties, getting married, and have kids, I have much less time to consume and discover new music, so I still rely on many of the old standbys that are represented on these tapes, especially when I am feeling sad, lonely, or emotional. At the same time, I can see how my taste has changed over time and into adulthood: I still listen to Elliott Smith quite a lot, but They Might Be Giants haven’t earned a spot in my iTunes. I recently bought this new Sony cassette and CD player for my 3-year-old daughter (Photo by Kristin Becker, 2018). Reading about the mission of the Media Archaeology Lab made me think about how the limits of cassette- and CD-based technology has defined my listening habits.CDs were common when I was in high school and college, but we still made mixed tapes because most people didn’t have CD players in their cars, and you couldn’t easily burn/copy CDs on personal computers yet. One of the big reasons I have trouble listening to new music is because there is less of a physical, material component to the process of consuming music: Once we had to manually change records, tapes, and CDs, now we just have to click a button in a software application. Album art and band photos still exist, but only in digital form, which is arguably much less enticing and personalized than the handmade tape covers in my photo above, or on the custom screen-printed CD covers commonly made by small indie bands in the 1990s and early 2000s. 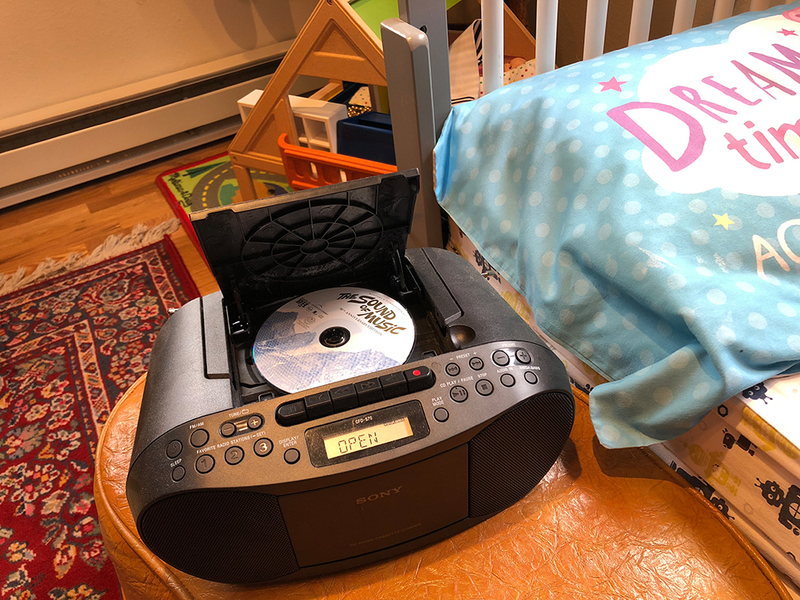 This is part of the reason I recently bought my three-year-old daughter her own CD and cassette-player for her room: I want her early musical experiences to be reinforced through visual, verbal, and tactile modes of communication. I already see this working because she loves to pore over the books that came with the her CDs for The Sounds of Music and Mary Poppins.